uCodeGirl's Crack the Code: STEM Mentorship for Girls brings together area women professionals in STEM and their teen mentees to facilitate one-on-one mentoring relationships as well as provide a project based group collaboration and networking opportunities for both mentors and mentees, throughout the year. Our goal is to build a support system for teen girls to be nurtured for STEM academic success and to support students’ pursuit of their academic and career aspirations by providing: Supportive mentoring relationships and STEM-focused projects, events and opportunities. Occurs once a month on a Tuesday starting in October 2018, from 6:00 pm to 8:00 pm. 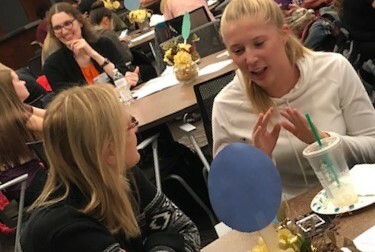 The 2nd annual Crack the Code: STEM Mentorship for Girls is a volunteer mentorship opportunities where STEM professionals give back to girls in the community with guidance and support, become a better leader and refine their skills and networks. What other interesting facts should we know about you? Opportunity to facilite the mentorship sessions is a great way to bond with your mentee and practice your leadership and public speaking skills. Yes, I would love to facilitate a session with my mentee. No, thanks. I will pass. Appreciate your awesomeness! Looking forward to travelling this impact filled journey with you!